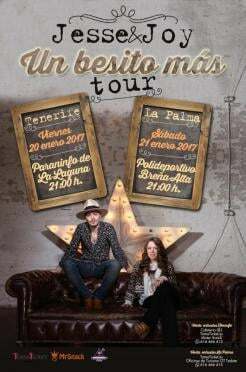 Jesse & Joy are a Mexucan Duo on a European tour 'Un Besito Mas', during which they will be playing in La Laguna on Friday 20th January. The popular musicians are presenting their fifth album and also have tour dates in London, Madrid and Barcelona. The concert ill take place at the lParaninfo de la Universidad de La Laguna at 9pm and tickets cost 20 Euros.